Logo design for Standing Dead Woodworks, owned and operated by Calgary craftsman Alistair Clark. Standing Dead Woodworks builds custom artisan furniture out of reclaimed and standing dead fall wood. If you look closely at the tree icon, you'll notice the letterforms for "S" and "D" stacked on top of one another. A secondary logo based on Alistair's handwritten signature was also created. Both logos were created to work across all possible platforms, from online to handmade cast iron brands that actually burn the logos into each unique piece of furniture. You can see Alistair's beautiful work at standingdeadwoodworks.com. Perry Educational Services is a very cool Alberta-based business I had the pleasure of doing some brand identity work for, including logo design, business cards, letterhead, and folders. When Phil Perry isn’t teaching construction management, he and Izzy are busy making new skydiving coaches and instructors. This creates a need for differentiation between the construction management and skydiving divisions of the business. A vertical slash and a greater sign are used to construct the letter “P” (for “Perry”). This creates opportunities for the logo to communicate “greater than” messages visually (such as, “Your career. Your education. Your life. GREATER.”). This iconography also lends itself to deconstruction to do this in interesting and abstract ways. Unique colour palettes and photography are used to differentiate between the construction management and skydiving divisions of the business, while still maintaining a consistent look and feel overall. 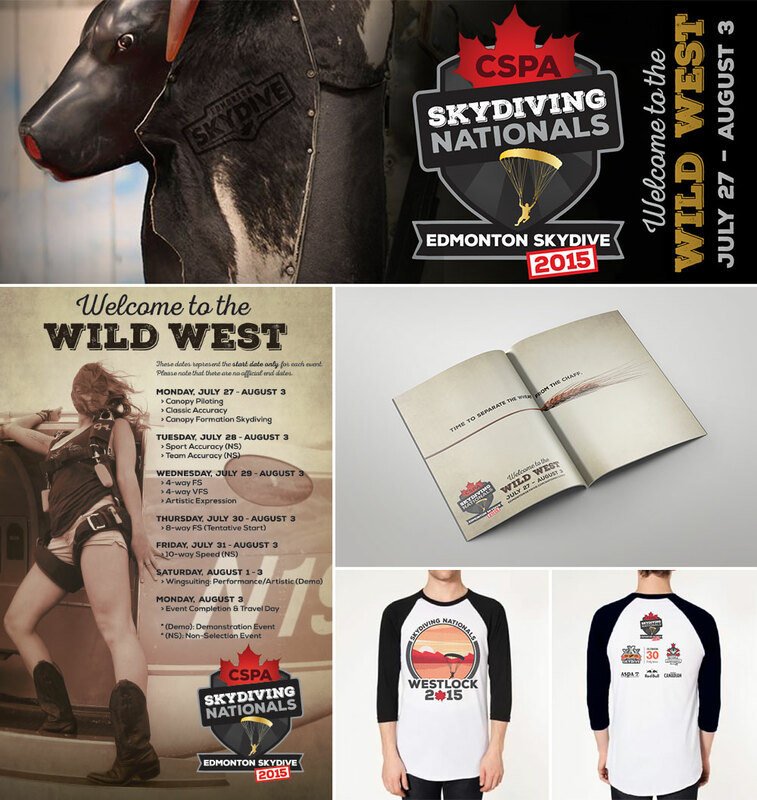 Logo, branding, print advertising, and other promotional materials created for Edmonton Skydive, host dropzone of the 2015 Canadian Sport Parachuting Association (CSPA) National Skydiving Championships. The CSPA Nationals are held biannually to recognize national champions in several skydiving disciplines, with top competitors going on to represent Canada at international skydiving meets. 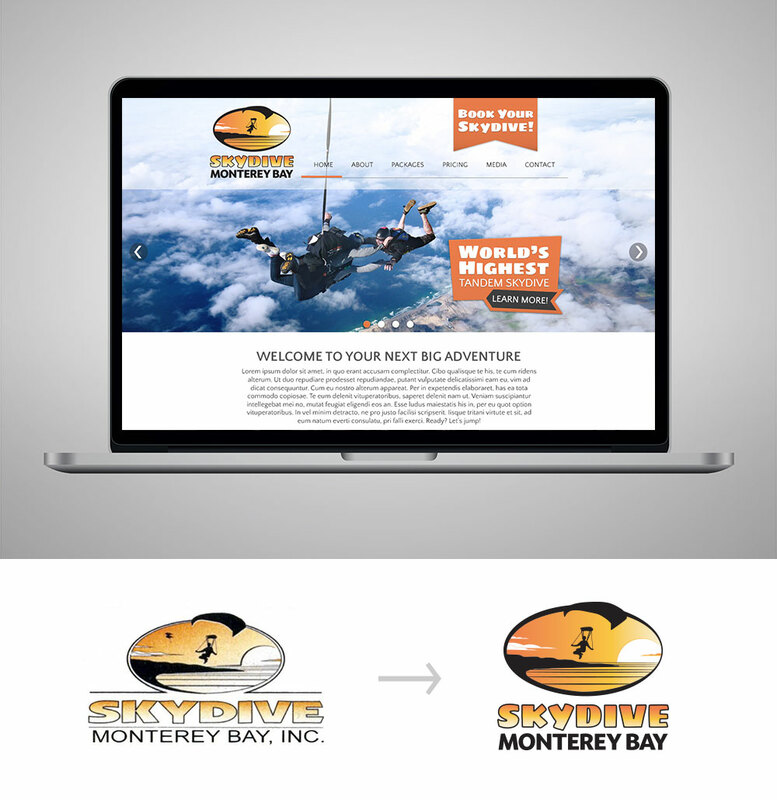 Skydive Monterey Bay, a surfside skydiving center in California, was looking for a subtle logo refresh, a new website, and some help getting started in the social media world. 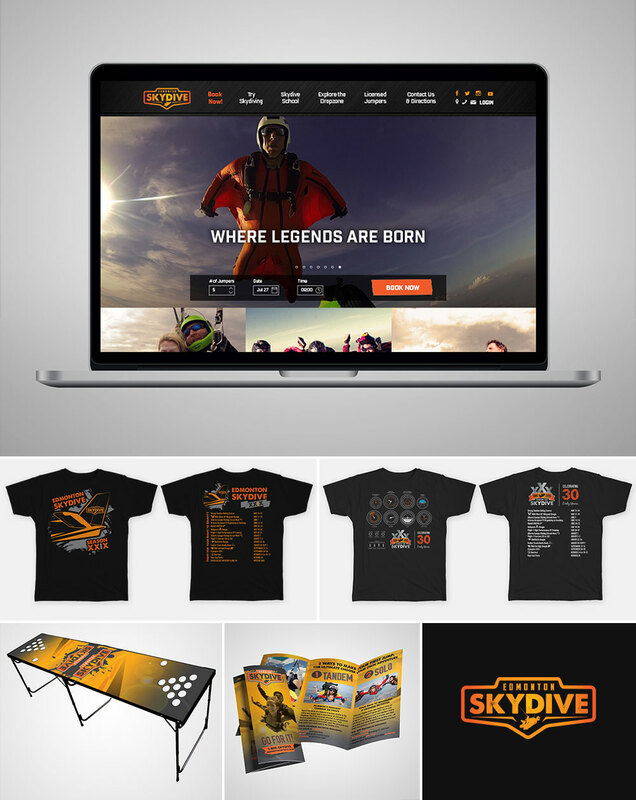 I worked with them to update their logo while maintaining the original logo concept, then brought together a small but mighty team of creative partners to launch Skydive Monterey Bay into the online world. We developed a website which showcased the phenomenal view while making it easy to book a skydive at any time, from any page. We also came up with a social media strategy, a year-long calendar of creative content, and a unique branded look (including profile images, cover images, and photography templates) to create a distinct online presence. You can check them out (and book the world’s highest tandem!) at skydivemontereybay.com. Brand identity project for Tiaosan, a research and consulting firm which provides project development, research, project management, and research mentorship services. Founded by a skydiver with a highly diverse background and an unusual outlook, the brand visually incorporates this information with a look and feel that reflects the founder's scientific approach. The final tagline? “Exceptional research from different perspective.” This project included logo development, business cards, and letterhead. 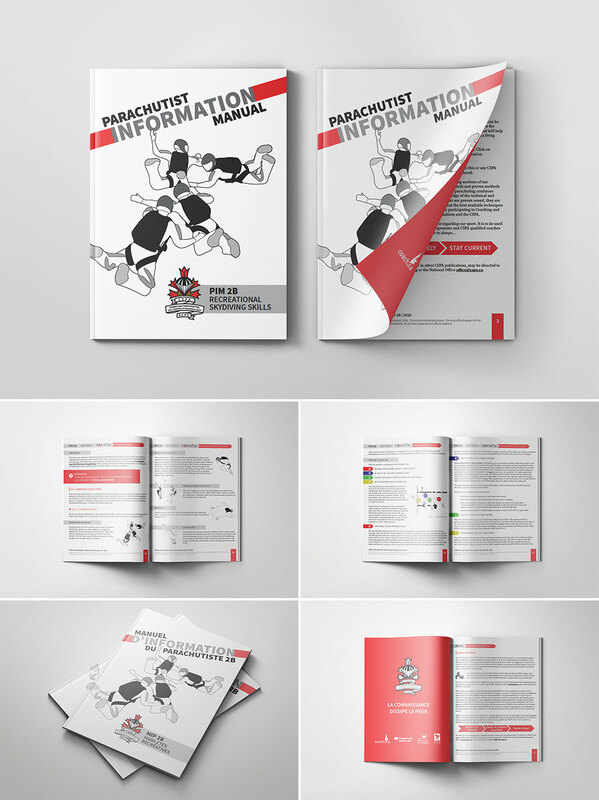 Cover design, inside layout, and illustrations for the Canadian Sport Parachute Association (CSPA) Parachutist Information Manual. Created in both French and English versions, the manual was designed to provide an easy-to-follow information structure throughout, as well as a consistent look and feel to ultimately be used across all CSPA manuals. The full manual can be downloaded from CSPA's website at cspa.ca. Michael Plouffe doesn't just fly planes. He's an aerobatic rockstar, an airshow dynamo. When he says he needs a logo to communicate “heart-stopping airshow excitement”, he means business. (No pressure, right?) For his logo I used an electrocardiogram (ECG) line as the smoke trail of an airplane, with ECG spikes that double as the “A” letterforms in “AVIATION”. The silver color lends a look that is industrial, high tech, and just a little bit like the polished aluminum of an aircraft. To book Michael for an airshow or advanced flight instruction, visit mpaviation.net. Looking for more? I am always posting new projects (both large and small!) on the Adventure Creative Facebook page.